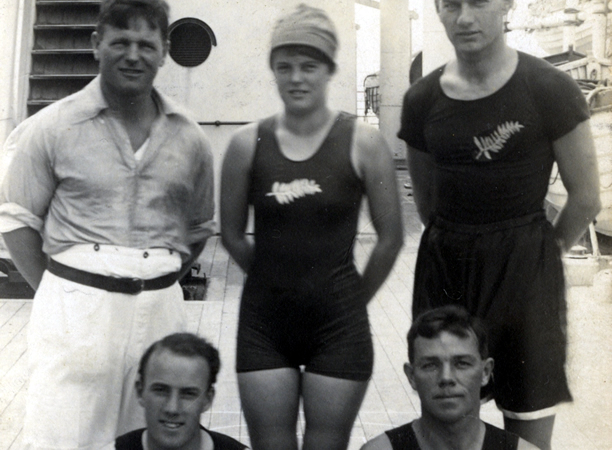 On 23 August 1920, 15-year-old Violet Waldron entered the chilly waters of an outdoor swimming pool in Antwerp and became New Zealand’s first female Olympian. Waldron was competing in a heat of the women’s 100m freestyle. In 1920, ‘freestyle’ meant exactly that – a variety of strokes could be (and were) used. At Antwerp, only Waldron and the American swimmers used the crawl, the face-down style now known as freestyle. Violet’s kick was propeller-like, while the Americans used a scissor-like kick. The other competitors were still using the ‘trudgen’, a combination of sidestroke and freestyle that is now considered slower. Waldron came second in her heat behind the powerful American, Ethelda Bleibtrey. Two days later, she placed fifth in the final. She was the fourth-fastest qualifier for the 300m freestyle final, but pulled out due to illness. The New Zealand team in 1920 comprised only four competitors. They had travelled for nine weeks to get to Antwerp, with delays in Australia and South Africa. They had no team uniform and only the fern leaves on their hatbands identified them as New Zealanders. It was New Zealand’s first Olympic team; previously they had competed alongside Australians as Australasia. Waldron’s father Cecil (‘Tui’) insisted on coming as her swimming coach and chaperon, and became the unofficial coach of the team. Following the Olympic Games, Violet came third in an 8km race in the River Thames, London. In 1923 she won the 100-yards freestyle at the Australian Swimming Union championships in Sydney. Not long after, her father declared that both Violet and her younger sister Edna (an accomplished swimmer and New Zealand’s top diver) would retire. Although she disagreed, the 18-year-old Waldron accepted her father’s ruling. We have 24 biographies, 10 articles, related to New Zealand's first female Olympian.